The end-to-end financial reporting process involves multiple steps, from closing the books on legal entities, to reconciliation, consolidation of results, analysis of trends, and release of results. An error at any point on the timeline – no matter how small – can result in a material weakness designation, intensified auditor scrutiny, and nagging concerns among investors. If attaining reporting perfection in this complex realm seems like an impossible task, factor in the additional compliance pressure that regulators place on auditors. In turn, auditors put pressure on clients to ensure a rigorous, transparent financial reporting process that senior accountants and analysts must usher along as fast as possible. Why the need for speed? Many CFOs feel the need to be one of the first in his or her industry to report earnings each quarter. The notion is that this builds shareholder and analyst confidence. Meanwhile, business unit leaders are typically chomping at the bit to see the official quarter-end tallies for revenues and costs so they can, if need be, adjust growth assumptions, resource allocation formulas, forward forecasts, and hiring plans. Because speed is as important as accuracy, APQC, a nonprofit business benchmarking and research firm based in Houston, decided to take a closer look at large companies’ cycle time from the completion of quarterly consolidated business entity financial statements to the release of earnings per share. The APQC study, which examined close-to-disclose cycle time for 524 companies with more than $1 billion in revenue, found that the top 25% were able to complete the entire C-to-D process in 12 days or less. 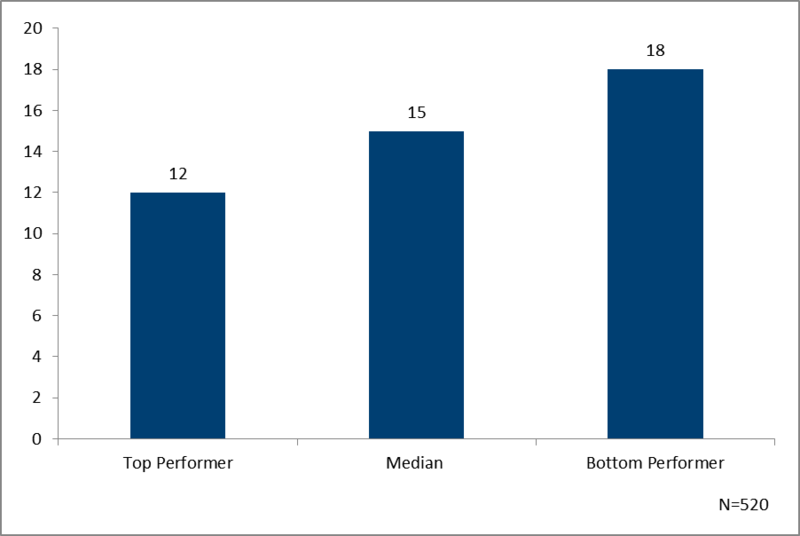 The median cycle time was 15 days, while the bottom 25% of companies took 18 days or longer. The worst performers needed up to 25 days to get the job done. APQC also examined the cost-efficiency of this process, studying the total cost to perform general accounting and reporting (excluding fixed assets) per $1,000 revenue for all companies with more than $1 billion in revenue. The top performers among these 524 organizations — those top 25% with the best cost-efficiency — get the job done for one quarter of the cost incurred by the bottom performers, the worst 25% of the group. Clearly, there is plenty of opportunity to boost the integrity of the close process, get it wrapped up with alacrity, and incur relatively low costs in the process. How can companies ensure that their close-to-disclose processes keep pace with their increasing complexity? The best-performing companies continuously step back, map their processes from end to end, identify bottlenecks and pressure points, pinpoint opportunities for error, and automate wherever possible to improve not just cycle time but the accuracy and cost-efficiency of financial reporting. In large companies built through acquisition, it’s not uncommon when preparing to close and disclose to pull data from 10 or more disparate transaction systems. Standardizing systems in an acquisitive global company may seem like an impossible dream—prior APQC research shows that fewer than 40% of large companies operate with a single ERP system (and 17% of these use multiple versions of that ERP application). Simplification is easier said than done. It’s not just a matter of ordering all units onto a single ERP system. Too often there is also the need to standardize processes, data, models, and reporting calendars across a sprawling enterprise. That’s an undertaking that many CEOs and CFOs find daunting and loaded with the risk of ugly budget and time-table over-runs. Still, there are remedial approaches that can help to some extent. Workflow automation – which is particularly valuable with time-consuming intercompany transactions – can allow senior managers to easily track sub-activities in the close process and prevent bottlenecks that arise when one activity is dependent on another. These systems also allow managers to continuously fine-tune the process by identifying snags and redundant steps and deploying fixes to avoid them in the future. While automation of redundant tasks can save time and money, the human element will always be necessary to do the job well. Some companies find that their highly skilled accountants’ time is best spent on analysis, while routine tasks can be outsourced to a shared-services center. The best-performing companies take a continuous improvement approach, constantly benchmarking their close-to-disclose efficiency and speed. By continuously evaluating processes, timetables, policies, and systems and incorporating best practices, companies continuously improve speed and cost efficiency. The result: more trustworthy numbers for operations managers, better-informed decisions, less risk, and disclose times that lead the pack. There are some interesting conclusions here, but I’d be interested in more – were the fastest C-to-D company processes also the least costly, or does it cost more to close quickly? Also, how do these processes actually correlate to company performance and / or stock price performance? Is faster really better, or are CFO’s who look to be first chasing the wind?